Hundreds of UFO enthusiasts gathered to watch an amazing colorful UFO Spectacle in the sky along the famous Copacabana beach in Rio de Janeiro on Saturday night. 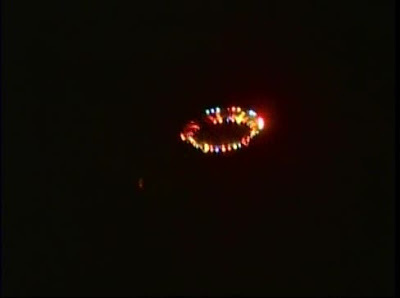 The seven-meter light show hovering in the sky was "Untitled (UFO)," an urban work of art created by American Peter Coffin. This was the second time Coffin had released his creation into a sea of thousands of cheering people, taking pictures of what will most likely be their only flying saucer sighting. The "Untitled (UFO)" first flight was in Gdansk, Poland, in July last year. Coffin said he and his partners at the Open Art's project chose Rio de Janeiro because of its unique natural beauty and because of the registered amount of extra-terrestrial sightings. He said he was happy to bring the "invisible" to the public. "It is a strange thing to make a UFO because you expect a UFO to be unreal but it is kind of part of the artist's responsibility to make the things that are invisible, make the things that we aspire to see or want to believe in."